The practice of making something out of wood. A manual or machine skill. In Joinery, the direction of the natural fibres in wood. The lines by which the wood can be split and by which it is sawn out of the log to make useful timber. Working a piece of wood along the grain so that the shavings are taken off in a smooth fashion. Working a piece of wood in the wrong direction so that the shavings are taken off in a in a rough and ragged fashion. 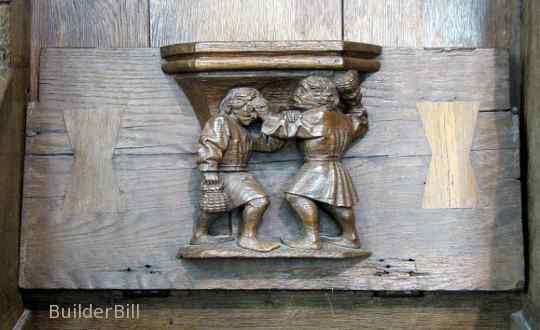 A medieval Misrericord (a bracket to the underside of a pew seat to rest on during long periods of standing) carved out of oak. Seen at the Ould Kirk in Amsterdam. The range of woodworking is enormous. From the practical but also whimsical fancy of the 16Th century wood carver above to the huge manufacturing plants that turn out furniture, doors and moulding. Working with wood has spanned millennia. Australian Aborigines have been said to have used carved and painted message sticks for tens of thousands of years. Wood has been use for weapons and for ploughs. It has been used for shelter and it has been used n the form of boats and carts for transport and exploration. It is impossible to separate woodworking from the development of the world as we know it. The fact that wood is a natural material must have something to do with the actual sheer pleasure gained from working with it. The feel, the touch and the smell all come into it and the large and growing army of amateur woodworkers will attest to the satisfaction gained by getting involved in woodworking in one way or another. This is the introductory page in this glossary section in which I hope to steer you through the sometimes confusing terms in the English language that refer to working with wood. Many of these technical and specialised terms have made it into the language in general. We may say that something "goes against the grain", or talk about "a knotty problem" for instance. Timber made out of layers of growth that build up each year and this produces in all types of woods the main defining feature of wood. The grain. In ideal conditions we may be using a straight grained timber that has no blemishes and it has been sawn straight along the grain. This is the exception rather than the rule. In the sketch above a board is shown side on. If it is planed or machined in the direction shown then the result will be a rough or chipped surface. Working against the grain produces inferior results. The first thing that any woodworker does before laying a tool or machine to a piece of wood is to look at it and observe the direction of the grain. There is always something to be gained by this and more often than not there is one particular slant of the grain that is the best. In the sketch above the tools would produce the best results going in the direction shown. One answer is to work from each direction separately. 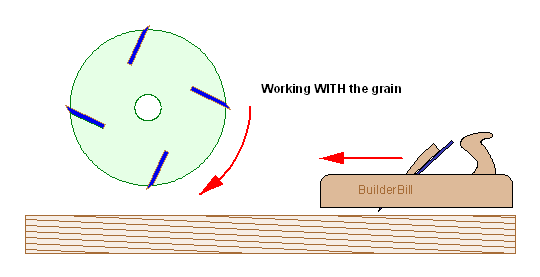 Another is to used a smaller tool with a more angled cutting surface suitable for working with contrary grain. In machine work it may be to sharpen up the blades and to take off less material with each cut.